Kathleen Rehl is currently scheduled to make more than 20 presentations this year, most of them to advisor groups. Kathleen Rehl is currently scheduled to make more than 20 presentations this year, most of them to advisor groups. (See her website, www.KathleenRehl.com, for a partial list.) There are several other opportunities for advisors to glean her insights and guidance about working with widows. Rehl co-teaches with Susan Bradley a two-day “Advisors Working With Widows” workshop through the Sudden Money Institute. Using teleclasses, coaching calls and practical assignments, this segment of Bradley’s Certified Financial Transitionist program educates advisors on how to guide their clients through the three stages of widowhood. (See www.SuddenMoney.com.) In addition, Rehl plans to bring together small groups of widows or advisors at a Saratoga Springs retreat house later this year, where she can spend time with each participant. She also anticipates coaching interested advisors one-on-one about assisting widowed clients. Rehl is also creating a communication guide for advisors working with widows (a companion to her “Working With Widows” booklet published last year by Protective Life Insurance), along with a four-part video guide for consumers dealing with the death of a loved one, which will be available on YouTube and on the Protective Life website. That’s typical of the many letters and comments that Kathleen Rehl has received about her book, “Moving Forward on Your Own: A Financial Guidebook for Widows.” First published in 2010, “Moving Forward” is the result of Rehl’s desire to integrate beautiful images and inspirational quotes with emotional and financial guidelines to help new widows navigate this wrenching life transition. I loved the art, photography and the meaningful quotes. With about 28,000 copies in circulation now, the book has won 10 national and international awards. 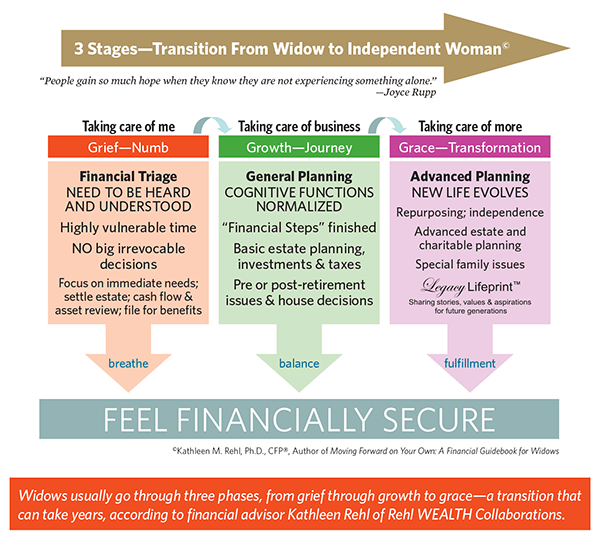 Rehl told me that since widows often don’t know what they need, especially in the grief phase, she designed “Moving Forward” as a gift book to be given by financial advisors, estate planning attorneys, clergy, psychological counselors, family members or friends. I found myself thinking that every advisor needs to have several copies of a valuable resource guide like this to give their bereaved clients.